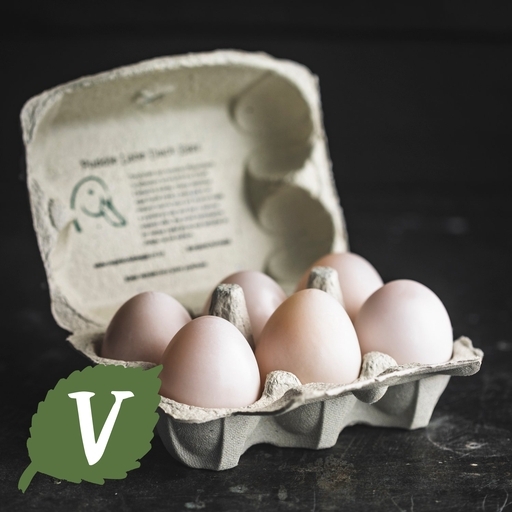 Organic free-range duck eggs from Haresfield Farm in Wiltshire. Rich, flavoursome and unbeatable for scrambling. Their fatty golden yolks and high-protein whites make them coveted by bakers – they make for the fluffiest cakes and creamiest custards. For more inspiration, read our quick tips for duck eggs. Use duck eggs anywhere you usually use hens’ eggs. Their richness makes them good for baking – the additional lift is particularly welcome in gluten-free recipes, really improving the texture. Extra protein means they are a little quicker to cook than hens’ eggs, so watch heat levels and timing. These beautiful eggs come from Haresfield Farm, Wiltshire. The happy Khaki Campbell ducks (a traditional laying breed) are raised from day-old ducklings according to full organic principles. They are kept in small groups and encouraged to exhibit their natural behaviours, to make sure they’re as happy and stress-free as possible. All day they are free to roam and paddle on the organic farmland, and at night they’re safely put away in their straw-covered house.